Supplying quality lubricants and additives throughout Kansas for over 55 years. Through Chevron we are able to provide to our customers with lubricants and additives to meet any need; whether automotive (passenger car), heavy duty, or industrial/construction. We are certified as a ‘1st Source Marketer’ by Chevron; this title is bestowed only on Chevron’s top tier marketers that follow stringent integrity guidelines. In 2008, our outstanding customer service ratings enabled us to be rated #1 of all Chevron First Source Marketers in the USA. 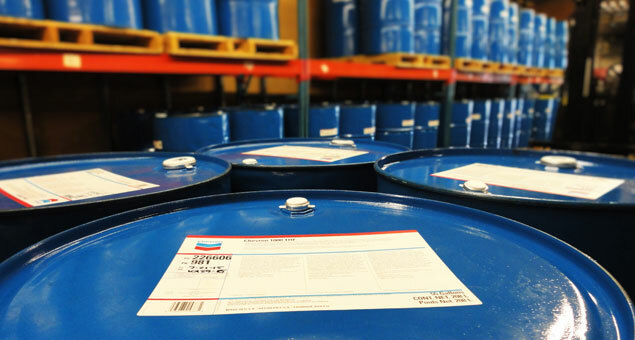 Chevron is a leader in finished lubricants and a leading global manufacturer of premium base oil. They sell products on six continents, employ a diverse workforce and operate hundreds of facilities worldwide. They recently completed a project that would cement their leadership role in lubricants. In January 2011, they announced the construction of a $1.4 billion premium base-oil facility at our Pascagoula, Mississippi, refinery. The Pascagoula facility is expected to produce approximately 25,000 barrels of premium base oil daily for use in the manufacture of high-performance lubricants such as motor oils for consumer and commercial uses. The plant began operation in July 2014. Effective coolants are vital to optimizing performance and extending engine life. Chevron’s patented organic corrosion inhibitors eliminate the need for supplemental coolant additives and improve hardware performance and heat transfer over the life of your engine. Delo® products are designed for on- and off-road applications, ranging from truck and bus transportation to construction, mining, agriculture and power generation. Across industries, Delo’s premium lubricants deliver world-class protection, performance and maximum operational reliability in a wide range of operating conditions. Capital City Oil has partnered with Chevron brands for over 30 plus years, their dedication and loyalty is hard to find this day and age in the industry. Marvin and his teams attention to detail, great customer service and cutting edge ISOCLEAN and Vacuum Dehydration processes make it a winning combination for both Capital City Oil and Chevron. Looking forward to the future with all that Capital City Oil has to offer! Start using lubricants from a trusted global industry leader.